A national priority at the Moroccan level is to understand the spatiotemporal rainfall irregularity to anticipate suitable strategies for water and agriculture management. The most northern mountainous region shows intense sensitivity to extreme hydroclimatic hazards which may compromise the future of socioeconomic acceleration and further weaken environmental balances. However, planning and decision making require accurate data, on a detailed scale and with good spatial distribution which is not the case in several south-Mediterranean countries where rainfall data and/or well-established hydro-meteorological network is lacking. In this paper, abundant rain gauge measurements combined with time-series open data (1958–2015) were used to study the rainfall variability. Results show an annual rainfall increase trend since 1996 with frequent, intense and abundant rains causing violent torrents and floods. This humid trend alternates with short but severe dry periods. Spatial distribution shows a rainfall increase from eastern to western area and from the coastal plains to high mountains. Based on a continuous daily rainfall dataset (from 1988 to 2012) from six scattered stations, it appears that the pattern of heavy and extreme wet days takes the form of an irregular interannual cycle. Trends of the annual precipitation daily concentration indicate a significant positive trend in the center than in the East of the study area. Considering these observations, a review of water needs/obligations priorities seems crucial so that a new conscious and adaptative environmental policy would approve new procedures for a sustainable management. During the twenty-first century, demographic and economic acceleration in the northern mountainous area of Morocco induced an infrastructure strengthening and a social wellness improvement. However, it indirectly gave rise to a socioeconomic functioning crisis which causes deep degradation. This degradation is mainly due to an inconvenient territorial planning and/or to an over-exploitation of a natural potential which is, already, weakened by its lithological, ecological and climatic fragilities. Such fragilities that can only worsen because of an advanced littoralization (of this coastal area) resulting in a multitude of natural and anthropogenic concern deficits. Natural deficits mainly concern problems of water scarcity, regression of agronomic potential, pollution, retreat of the shoreline and disappearance of coastal dunes. In contrast, anthropogenic deficits refer to the intensification of national and international migration flows, the increase in social exclusion, the difficulty of access to basic services (health and education), the degradation of the sociocultural heritage, the proliferation of the informal economy and the increasing water demand (mostly during summer season and in rural zones). These findings cause difficulties in management, a disharmony between decision makers and stakeholders (public administrations, local authorities, elected, civil society, etc.) and a synergy lack between public and private interventions. This is reflected as obstacles in the development models used so far which make the current management look like a continuous response to unexpected problems rather than strategic planning. The Mediterranean climate is known by a strong seasonal contrast which creates a unique hydrological regime with the driest season in summer. Rainfall is generally not very abundant but spatiotemporally concentrated causing extreme and violent floods. These last are the natural hazard causing the most human and economic damages in the Mediterranean countries . The quick flood generation potential is important throughout the Mediterranean basin due to its steep topography, small-sized basins and a scarce vegetation cover. 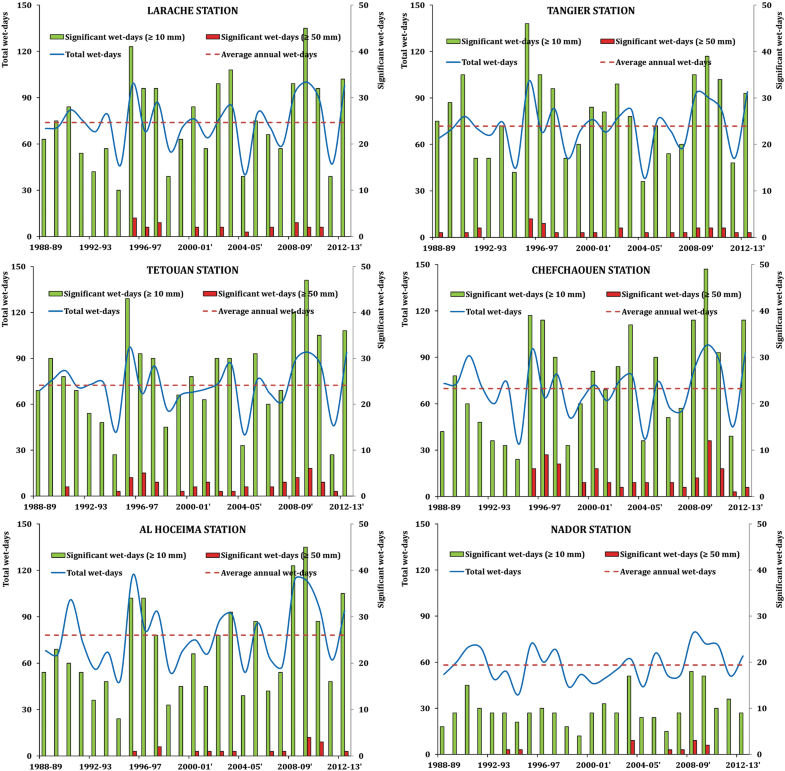 Climatic scenarios indicate a significant temperature rise associated with an annual rainfall decrease and a likely multiplication of extreme rainfall events in many parts of the Mediterranean basin [2, 3, 4]. Therefore, vulnerability to these extreme floods and droughts events could increase, especially for developing countries . Northern Morocco is particularly sensitive to extreme hydroclimatic events, especially floods related to intense rainfall events and droughts related to the high interannual variability of rainfall. For example, the cities of Tetouan, Tangier and Al Hoceima are located downstream of their respective watersheds exposed, thus, to serious damage during repetitive violent floods [6, 7, 8]. An analytical review of the regional constraints in water sector shows a distortion between population growth curves and those of water needs which causes a constant decline in water availability [9, 10]. Besides, successive droughts reveal the necessity of a strategic planning which takes into consideration the recurrent and opposite extreme climatic events; thus, it should at the same time manage scarcity and abundance of water resources. The gap between the mobilization and the use of water imposes an implementation of a national vision integrating all the users within a coherent and collaborative approach of demand management . Rural population takes water through springs and wells on a few limited coastal alluvial aquifers or on an expanded convex karstic ridge and streams which depend on it. Thus, these natural water systems play a key role in maintaining rural territorial balance and supporting neighboring urban areas. However, management does not consider the watershed concept for sharing natural assets and socioeconomic benefits between rural upstream (water producers) and urban downstream administrative divisions (water users mostly). Managers must therefore maintain the delicate balance between the conservation of water resources (exposed to pollution and over-exploitation) and the satisfaction of the increase in downstream demand while ensuring the improvement of socioeconomic infrastructures and welfare upstream. The precise estimation of the spatial distribution of precipitation in large and diverse areas with few meteorological stations is complex, especially in mountainous areas. In northern Morocco, topographic conditions are very variable (altitude, slope and aspect) and cause strong climatological gradients, which are difficult to capture with punctual measurements in meteorological stations. In addition, in high mountainous areas, the density of the monitoring network is usually low due to the difficult access. However, the lack of quality and availability, and the coverage problems of rain gauges do not exist in current satellite precipitation products and in reanalysis data. The benefits of these products are their consistency and uniformity in the estimation of temporal and spatial variability. A disadvantage is the need to correct occasionally potential errors by station data to obtain sufficiently accurate estimations for regional assessments. 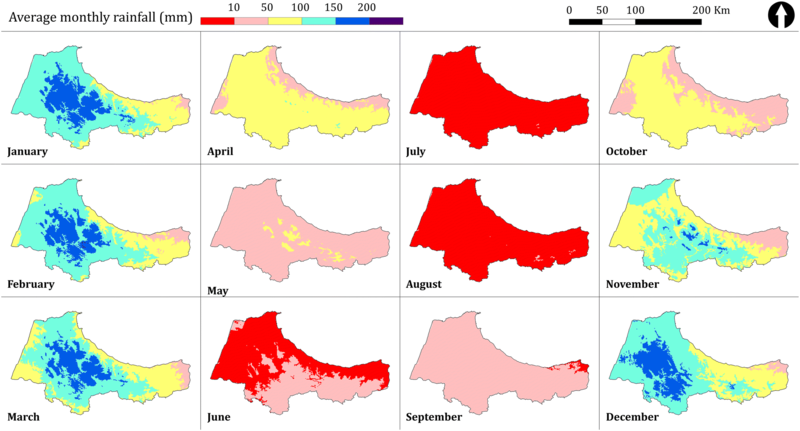 Combining both rain gauge and reanalysis data, the main objective of this study is to capture the spatial and temporal variability of rainfall in northern Morocco. Specific objectives of this study are to study the trends of the daily precipitation concentration index and to derive maps of the rainfall distribution. In Morocco, the geographical position gives the country a great bioclimatic diversity. Its Mediterranean climate is characterized by mild-wet winters and hot-dry summers. Enormous climatic variations are observed: from sub-humid in the north, semiarid to arid in the center, to Saharan in the South. More than 50% of the precipitations are concentrated over only 15% of the country area . Spatial and temporal variability of the average annual rainfall is very important. Thus, while it hardly exceeds 200 mm in south, it may exceed 1000 mm in the northern mountainous areas. The rainy season lasts usually from October to March in most of the countries, with the wettest period extending from December to February. 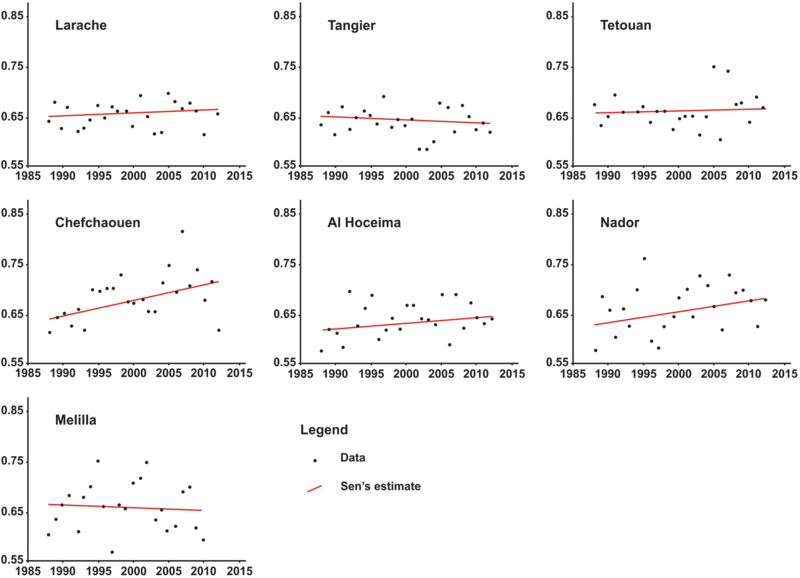 The high interannual rainfall variability is also a relevant character of the Moroccan climates. The study area is the northern region administratively called “Tangier-Tetouan-Al Hoceima” (Fig. 1) which is one of the twelve regions of the Moroccan kingdom instituted by the last territorial subdivision of 2015. It is in a mountainous range (geographically called the “Rif”), and it is bordered by the Mediterranean Sea to the North, the Atlantic Ocean to the West, to the South by the Rabat-Sale-Kenitra and Fes-Meknes regions and to the East by the eastern region. Its Mediterranean climate on the coastal area is nuanced by altitude and continentality traits with abundant snow on the interior reliefs. The mountainous aspect creates climatic sub-zones where conditions may diverge considerably from the general context. Thus, the average annual rainfall varies from about 400 up to over 1000 mm according to the geographical position. The study area is characterized by a tempered climate with dry summers and mild, moist winters. Thus, it is of the wettest areas of Morocco because of its altitudes and its double maritime facade. To study rainfall variability, monthly rainfall series were compiled from the Directorate of national meteorology data base (53 meteorological stations). 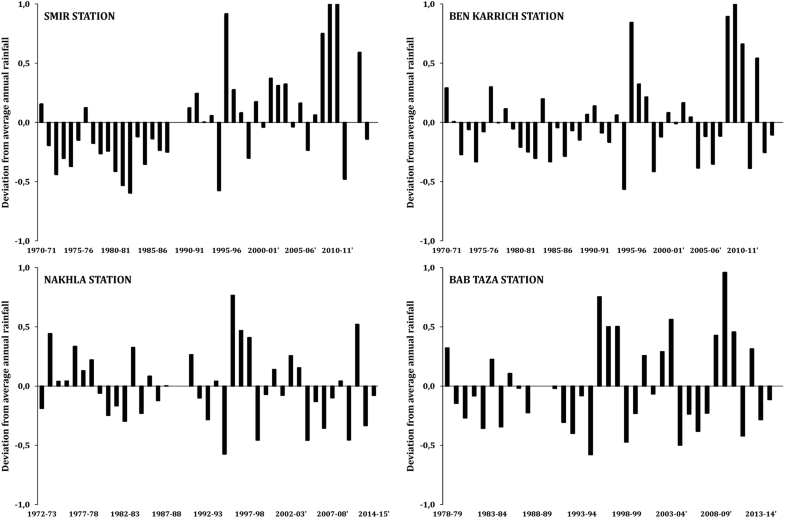 All stations (rain gauges) with over 30 years lacking a maximum of 5% of data were selected. To select a larger set of reference series, shorter series with over 10 years lacking a maximum of 5% of data were also chosen, and hence, the series with too many gaps were discarded. Using those criteria, long-term series of monthly rainfall from 37 stations were selected and 16 shorter series were accepted as eligible reference series. In data-sparse regions, studies are limited by the availability of comprehensive information on precipitation [12, 13, 14]. In the center of our study area, rain gauge data are only available for a relatively small number of locations, which are mostly located close to cities and therefore are not representative. Hence, the usefulness of satellite rainfall data is becoming increasingly available and accessible. These data were used, in our case, to map the average annual and monthly spatiotemporal rainfall variations. Currently, there are several satellite products available offering rainfall data that can be used for hydrological studies. This increasing amount of remote sensing open data, in addition to other related biophysical variables such as vegetation index and altitude, allows more detailed assessment. One of the most used is Reanalysis (NCEP/NCAR) which is a numerical model that allows obtaining monthly meteorological information of various climate elements (precipitation, temperature, relative humidity, atmospheric pressure, etc.). This model was planned originally to span 40 years (1957–96), but it was extended back to 1948 and continues to the present day. It has worldwide coverage, and it has been used to study the global and regional climate [15, 16, 17]. Likewise, the European Centre for Medium-Range Weather Forecasts (ECMWF) has released other global products of meteorological observations such as ERA-40 and ERA-Interim reanalysis [18, 19] which have been widely tested [20, 21, 22]. Several studies show high benefits of using satellite rainfall estimates for pluviometric and hydrologic modeling [23, 24, 25, 26, 27]. Thus, an innovative approach combining these estimates with rain gauge measurements allows accurate rainfall evaluation and the analysis of its temporal and spatial variability [28, 29, 30, 31]. In our case, a dataset of high spatial resolution (1/24°, ~ 4-km) monthly climate and climatic water balance for global terrestrial surfaces from 1958 to 2015 was used. This dataset, called “TerraClimate” [32, 33], uses climatically aided interpolation, combining high spatial resolution climatological normals from the WorldClim dataset [34, 35, 36], with coarser resolution time-varying (i.e., monthly) data from other sources to produce a monthly dataset of rainfall, maximum and minimum temperature, evapotranspiration, wind speed and solar radiation [32, 36]. These data provide important inputs for ecological and hydrological studies at global scales that require high spatial resolution and time-varying climate and climatic water balance data [35, 36, 37]. Further, the research focuses on a comprehensive database of continuous daily rainfall datasets (from 1988 to 2012) from six scattered stations to study the trends of the daily precipitation. Data accuracy, quality and homogeneity are guaranteed by the Directorate of national meteorology as shown in previous studies [10, 38, 39, 40]. 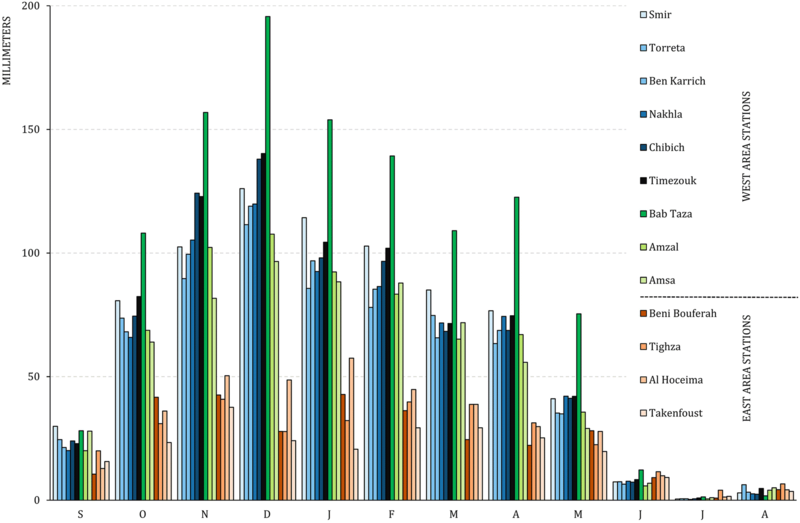 Daily rainfall data were extracted for the time between September and August. Over 65,000 records were obtained and then summed into their corresponding months within each year. These monthly totals allowed the matching of seasonal climate variability to the dataset. For the intensity distribution of daily rainfall, a wet day in this study is defined to be one in which there is at least 1 mm of precipitation on record [41, 42, 43, 44]. This is particularly important because many studies attribute the rainfall mutations to a variability of its amount on wet days rather than an increase in the number of wet days . Significant wet days were also considered to follow the heavy rainfall days (over 10 mm/day) and extreme rainfalls occurrence (over 50 mm/day) [46, 47, 48, 49]. The importance of mapping, quantifying and monitoring changes of meteorological parameters has been widely recognized in the scientific community as a key element in the study of global change. An attractive and useful way to carry out such studies is to use open data, especially in countries/places where time-series databases are unavailable and/or incomplete. An analysis of the annual and monthly spatiotemporal variability maps was performed in this study. The study of intense daily rainfall is essential since they provide, in a short time, a large amount of water that equal values usually recorded in one or, even, in several months. Cumulative rainfall of 10 mm per day in small (or even micro) intramountainous watersheds are considered as “heavy,” whereas cumulative rainfall of 50 mm per day is considered as critical (“extreme” wet days). Exceeding these thresholds (combined with the regional small-sized watersheds, their escarpment and low permeability) can cause severe flooding in densely urbanized downstream areas. The rainfall concentration is a key element of the Mediterranean intra-annual climate variability. An unbalanced distribution of rainfall evokes periods of rainfall excess or drought which make plant and crop growth difficult [50, 51, 52, 53]. Thus, daily rainfall analysis is a subject of great interest in Morocco because of the high amounts of annual total precipitation falling in a limited number of very rainy days. A statistical derived concentration index is used in quantifying the relative distribution of the rainfall patterns. In this paper, the daily precipitation concentration index (CI) has been assessed after the methodology proposed by Martin-Vide . The concentration index (CI) is used as a concentration measure where a high precipitation CI value indicates that precipitation is more concentrated within a few rainy days during the year and vice versa [55, 56]. Under a Mediterranean climate, in a year considered “wet” (the total rainfall is significantly above the average), and this implies that abundant rainfall concentrated over a few days can cause floods, while drought prevails over most of the year. To enhance the visual analysis of the concentration of daily precipitation studied through CI (or simply the percentage of rain contributed by 25% of the rainiest days), a spatial interpolation was performed using ordinary kriging. Studies shows that CI is an estimator of erosivity and aggressivity of rainfall, where precipitation records on hourly or minute resolution do not exist [54, 57, 58]. This makes the CI very useful in environmental studies whose aim is to estimate the risk of soil loss or evaluate the intensity of erosive processes. The spatiotemporal trends of rainfall were analyzed by the nonparametrical Mann–Kendall [59, 60] and the Sen’s slope tests . 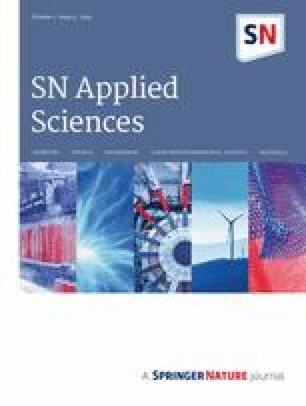 These statistical tests are very well described in many studies, and their efficiency and power are already demonstrated for similar applications [62, 63, 64, 65, 66]. 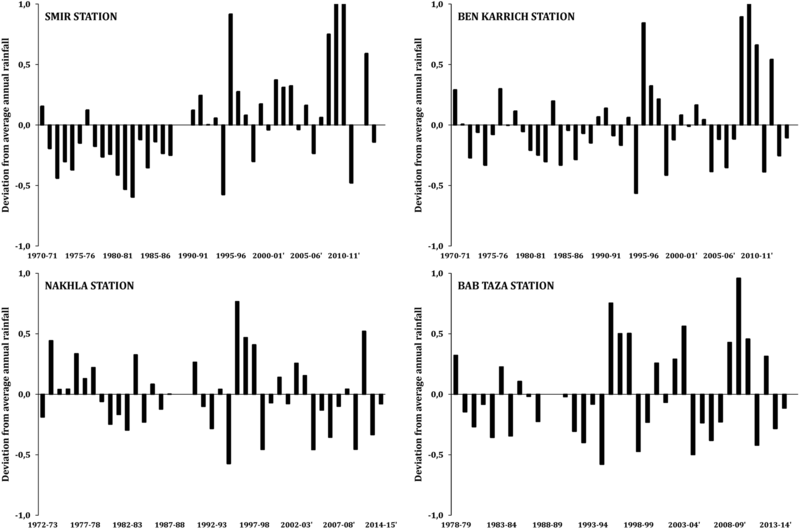 Series of values of annual concentration of daily precipitation from the six stations were analyzed for the period 1988–2012. The availability of daily data (1988–2010) in the station of Melilla (near Nador) led us to use it as the seventh station for the analysis. Unlike it was expected by previous scenarios based on extended dry periods during the 1970s, 1980s and first half of the 1990s [7, 9, 67], trend analysis of annual and seasonal time series (Figs. 2, 3) shows a rainfall increase since 1996 with frequent, intense and abundant rains causing violent torrents and floods. The observed annual and seasonal variation of rainfall is characterized by quick transitions that can be described as “jumps” . 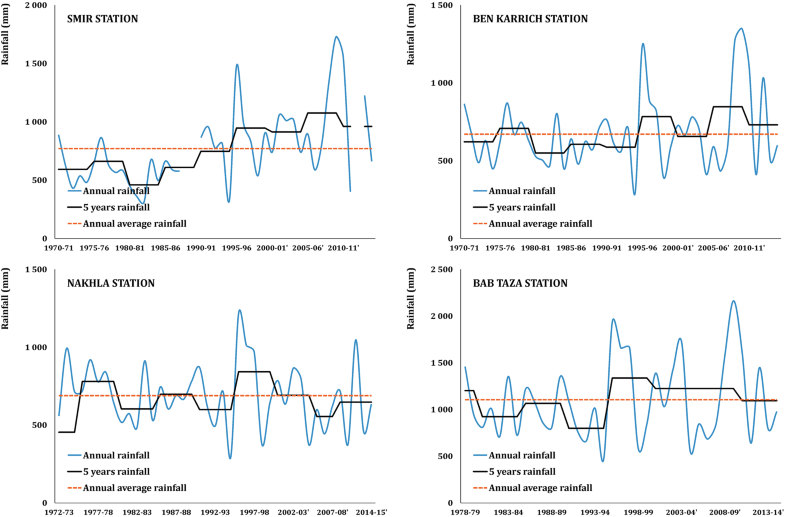 Indeed, trends of annual precipitation daily concentration, its annual CI obtained by Mann–Kendall test and Sen’s slope estimator show significant changes in the annual concentration of precipitation among the period 1970–2012 in five of the six stations, which indicates a significant positive trend (Table 1). The 5-year rainfall analysis (Fig. 2) and rainfall anomaly charts (Fig. 3) report that the last observation which suggests a rainfall increase in the upcoming years could be reflected in runoff and aquifer recharge. Nevertheless, the rainfall data show the high probability of sudden and prolonged changes in the precipitation regime (Figs. 2, 3). Therefore, seasonal rainfall spatiotemporal variability is very significant mostly between winters and summers (Figs. 4, 6). If records indicate only 2% of the annual rainfall average in summers in eastern area (Tighza and Al Hoceima stations), it is up to 8% in western area (Table 2). In winters, rainfall rate ranges around 45% and 37% in western and eastern area, respectively (Table 2). Autumn and spring receive, each, practically a fourth part of annual rainfall rate in almost all stations (Table 2). Monthly rainfall changes considerably with a trend of extreme interannual variations (Figs. 3, 4). From a monthly point of view, rainfall increases progressively from October to December, and then, it decreases slowly until late May when dry period begins (Figs. 4, 6). Spatial distribution shows an increase in rainfall from eastern to western area and from the coastal plains to the high mountains (Bab Taza station) (Fig. 6). Looking at the watershed aspect, it is observed that the topographical and geographical locations have a strong impact on rainfall variability (Figs. 1, 5, 6). The spatial distribution of rainfall is closely correlated with topographic conditions as suggested in many studies in mountainous regions [69, 70, 71, 72, 73]. Thus, in our case, the highest annual average rainfall (over 1000 mm) is linked to elevations of more than 800 m. Obviously, the heavy cloud masses are discharged mainly inside the mountainous belt (which act as an atmospheric barrier or enhancing convection). When they are lighter, these cloudy masses transit to the plains where they discharge less precipitation. Otherwise, many rainfall microzones are observed due to the regional complexity of topographical and geographical settings. Consequently, rainfall distribution shows spatiotemporal variability depending on the season as well as the proximity of the sea and the altitude (Figs. 4, 5, 6). The mountainous axial ridge is wetter than the rest of the region; the rainfall during the winter and spring can reach up to 200 mm per month mainly between November and February. The rainfall decreases gradually from the center to coast and from west to east, where the average monthly rainfall does not exceed 50 mm. The summer rainfall in the study area is very low, and it is generally under 10 mm during the whole months from June to August. The overall distribution of rainfall shows a good agreement with the well-known pattern and rainfall cycle in western Mediterranean coastal zone [74, 75, 76, 77]. The wet-day (≥ 1 mm) occurrence analysis indicates an average number that typically exceeds 70 wet days per year at the regional level. The Nador station (located 100 km beyond the eastern edge of the region) has the lowest average (58) (Table 3). The average number of wet days is not correlated with the average annual rainfall at 95% confident level (Pearson’s r = 0.72, p value = 0.051) (Table 3). With small disparities in rainfall volume and in the total number of wet days, there is a general annual correlation between the different stations in the region. The occurrence of wet days takes the form of alternating positive and negative peaks compared to the annual average. The succession of years with positive peaks is more recurring mostly since the beginning of the twenty-first century indicating a positive trend of occurrence of wet days (Fig. 7). The pattern of heavy rainfall takes the same behavior of wet-days occurrence (Fig. 7). The stations located inside the mountainous belt (Chefchaouen then Tetouan) receive more frequent and repetitive extreme rainfall within the same year (every 5–6 years) (Fig. 7). Going through the East, these extreme episodes are losing frequency and annual magnitude. The CI values are represented through isopleths (Fig. 8) which enable the spatial patterns of daily precipitation concentration to be determined. In general, a value of 0.61 means that 70% of the total precipitation falls on 25% of the rainiest days . In our case, values range between 0.64 (approximately 75%) and 0.71 (over 78%) which expresses a high daily concentration of rainfall in the whole region. 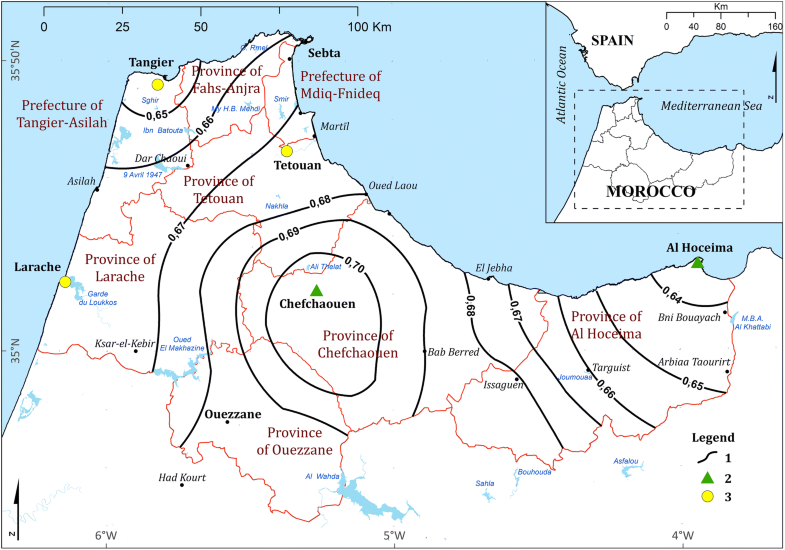 The CI value increases from the coastline toward the central mountainous barrier (Chefchaouen area). A high isopleth gradient from Tetouan and Jebha toward Chefchaouen defines very well the highest concentration in the previously mentioned area, while the lowest CI values are observed through the eastern coastline (Al Hoceima) and the western one (Tangier). The map (Fig. 8) presents considerable geographic coherence and identifies the area with the most daily rainfall contrast and the most critical intensity and aggressivity of rainfall. The Moroccan most northern facade is known by its Mediterranean depressions which produce highly contrasting daily amounts (sometimes very large). Trends of annual precipitation daily concentration, its annual CI, obtained by Mann–Kendall test and Sen’s slope estimator are given in Table 4. 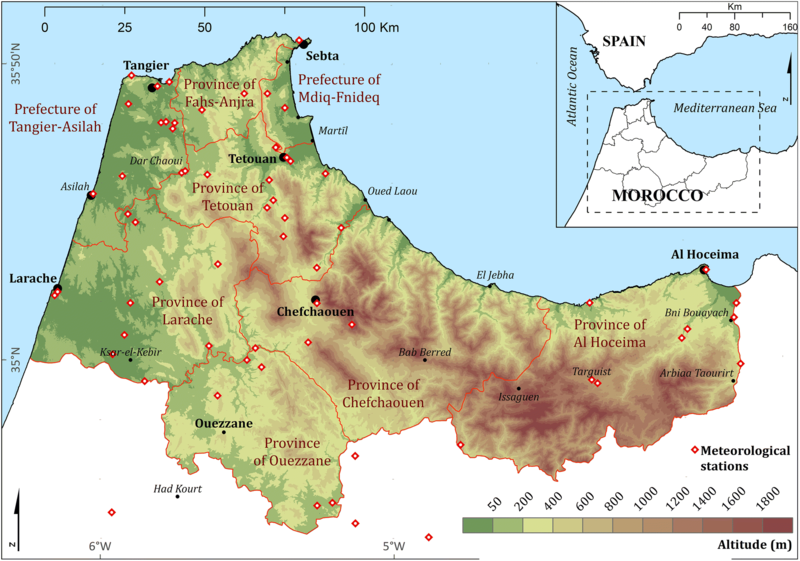 According to these results, significant changes in the annual concentration of precipitation are observed in two stations, which indicate a significant positive trend with an increase of 0.001 and 0.003 per year in the annual CI in the stations of Al Hoceima and Chefchaouen, respectively. This has a potential impact in different sectors, such as agriculture and land management. None of the other five stations indicates a significant negative trend. The Mann–Kendal test shows a statistical significance of 99% (very good) in the Chefchaouen station, 90% (acceptable) in Al Hoceima and below 70% (dubious) in the five other stations (Fig. 9). 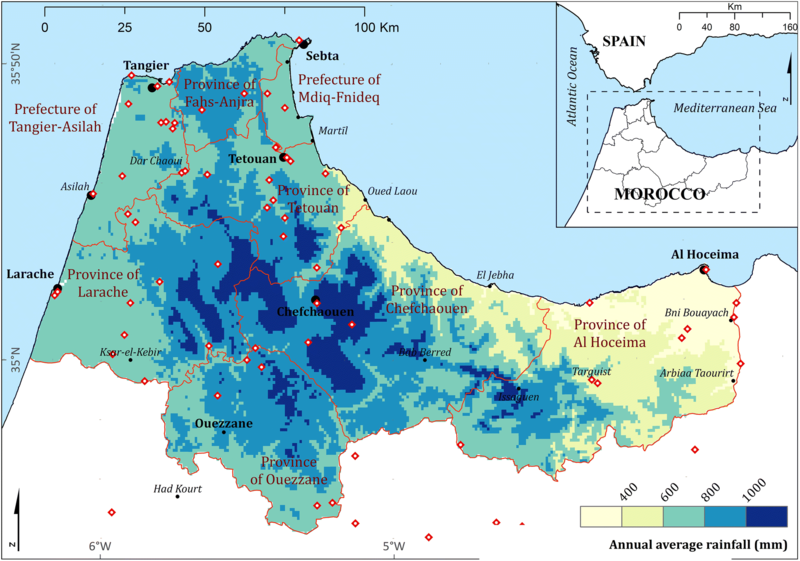 Morocco is a country where climatic and hydrological stations are numerous, although their distribution remains heterogeneous. The database currently available is sufficient to carry out a study of rainfall trends. Moreover, free open short time-series data demonstrate a great interest on how to overcome the lack of data for rainfall description and monitoring in areas, where data are unavailable, expensive or difficultly accessible. The northern Morocco is known for its natural fragility and for its unique sociocultural legacy. The zone is invited, ever more, to play a key and determining role in the national development strategy (tourism, agriculture, trade, transfer and redistribution of natural and financial resources, etc.). Currently, disparities and/or mutations both on its spatial components and on the exploitation of it resources are perceived. These disparities become more and more serious over various shapes between watersheds, and even between upstream and downstream of the same one. Water, whose scarcity increases progressively, is a common element in the territorial mutations of this mountain unit. Deep and rapid socioeconomic and environmental mutations are observed, during the last decades, because of several cause/effect interactions related to local, central decisions or to the international context (emigration to Europe for example). In addition, the increasing demographic pressure, the accelerated urbanization phenomenon and the huge economic modern projects require an enormous water demand making the mobilization of limited water resources become a determining obligation/necessity. The urban expansion on coastal plains is a permanent threat to aquifer resources. Also, inadequate or improper sanitation systems expose the water potential in many places to an increasing groundwater pollution vulnerability [78, 79, 80]. These poorly controlled mutations, usually without parallel hydrological studies or monitoring, threaten a major risk in the future of economic, social and environmental development. The mountainous northern area is particularly affected by constraints to development such as limited water resources, irregular rainfall regime, successive drought periods alternating with extreme storms. Deforestation, erosion, desertification, poverty and decline of agricultural land, water scarcity and pollution are critical problems. Considering the above findings, a review of water needs/obligations priorities seems crucial. Management schemes must be based on a new conscious and adaptative environmental policy (based on recent, reliable and feasible results) which will make it possible to develop procedures for a sustainable management. The rainfall distribution of northern Morocco has changed during the last 30 years of the twentieth century as a general trend toward drier conditions, which coincided with an increase in average temperatures according to the trend of climate change in the Mediterranean area [15, 39, 81, 82]. In the same period, river flows show a downward trend attributed mainly to a rainfall decrease and an increase in evapotranspiration (key element on Mediterranean water balance) [39, 74, 83]. Significant global warming combined with the lack of rainfall and increasing evapotranspiration will lead to a growing water deficit that weakens the supply–demand balance . An improved way would be a better evapotranspiration consideration through the distinction of main land use types (rainfed crops, annual irrigated crops and trees, natural vegetation, bare soil, etc.) to seek a better adjustment to the real water needs of natural systems, evolve toward hydrically more economical crops and avoid the current abuse in grass irrigation. Inevitably, current excessive rates of “virtual water” (water that is used in the production process of a commodity) [84, 85, 86, 87] export flow (national and international) should be reduced. However, since the beginning of the twenty-first century, a new rainfall trend is perceived at the regional level. It is characterized by a general humid tendency alternating with short but severe dry periods (questioning the adequacy of the current hydrological storage modes). At the seasonal level, there is a decrease in the importance of spring and autumn as transitional seasons between winter and summer. Regional climate seems moving toward an irregularity intensification with wet–dry peaks in apparent continuous change beyond the seasons they characterize. Prolonged detailed monitoring of climate conditions will help to anticipate and guide decisions. The use of Mann–Kendall and Sen’s slope estimator statistical tests shows their performance in the rainfall trend detection. They highlight the significant weight of daily rainfall in the regional pluviometric regime. Therefore, the daily precipitation concentration index (CI) shows an upward trend in northern Morocco which makes this index (as an estimator of erosivity and aggressivity of rainfall) very useful for upcoming studies on soil erosion, water resources management and territorial planning. This study was funded by the National Center for Scientific and Technical Research (CNRST, Morocco) [Contract Number PPR/11/2015] and by the International Foundation for Science (IFS, Sweden) [Grant Number W5342-1]. TerraClimate dataset is available in http://www.climatologylab.org/terraclimate.html.